Are you looking for resources to make your job easier? What about best practices from leading training experts and top companies to take your organization to the next level? Could you benefit from having new learning technologies explained in clear and understandable terms? Ready to expand your network? Join ATD today, and put the power of membership on your side. How Can ATD Membership Help? You serve your clients and support your organization. Empower yourself and the work you do with ATD membership. Explore our member benefits below. We provide access to practical resources, cutting-edge research, and the opportunity to network with your peers from around the world. Our award-winning magazine reports on and examines industry trends. Members receive 12 issues per year and access to the publication’s digital archives. Read the latest books from industry thought leaders, included in your membership. Professional members can select one; Professional Plus members select two. Each issue offers a deep dive on a crucial topic in talent development. Professional members can select one issue per year; Professional Plus members select four. Get the latest industry research and data to help you make effective business decisions. Professional Plus members select one. ATD’s annual research report detailing workplace talent development trends is valued at $499, but the digital version is free to members. These data-driven reports highlight key findings from our full research reports at a glance. Quickly build your skills and competencies on critical topics with these time-saving guides. Members can attend live or visit the full archive. A repository that houses all of ATD's video content with hundreds of hours of resources for members. A curated collection of proven talent development case study solutions from top performing organizations around the world. Discounts, Discounts, and More Discounts! Members receive discounted rates on conferences, education programs, certifications, publications, and much more. Member discounts are noted on our pricing pages and applied automatically to your order. Thanks to ATD, I have a ready cadre of professionals to consult with and amazing access to online resources when needed. Name a new idea in L&D—I heard about it first through ATD. I've been an ATD member for almost 25 years. I count my ATD friends as my most valued career relationships. One of the things that ATD does a great job of is not only organizing the right resources, but also making them accessible and actionable. It is through my ATD membership that I typically hear the latest thinking and ideas first. You know ATD membership is worth it. Now let's convince your boss! Need to hone your instructional design skills? Is your company launching into mobile learning? ATD members benefit from discounts on premier professional development, including workshops, certificate programs, and our Master Series assessment programs. No other organization offers the kind of professional development geared specifically to the needs of today’s talent development professionals. ATD keeps its members up to date on the latest industry trends, resources, and best practices through articles, webcasts, blogs, and more. 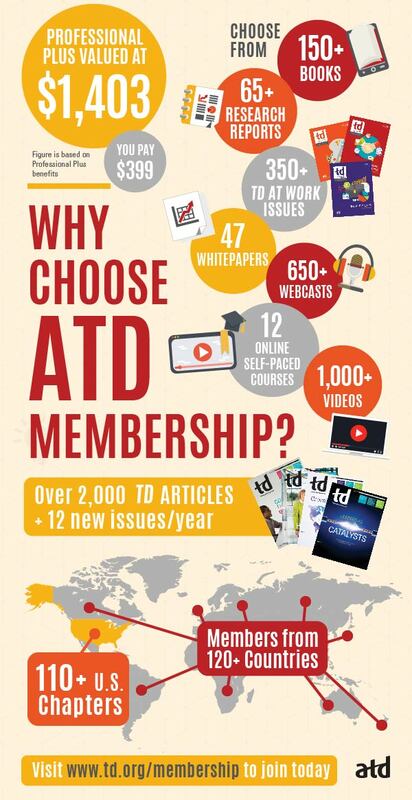 Members receive a monthly copy of TD magazine, ATD’s award-winning publication that keeps you updated on leading-edge content from the industry’s most sought-after thought leaders. Members can also benchmark their organization’s training practices against the industry’s best through the State of the Industry report, ATD’s yearly review of training and development trends. Need a template to manage your training projects? Trying to figure out the cost of developing a curriculum? Maybe you’re looking for a quick job aid or deeper insights from an industry leader? Members have access to practical tools, templates, and more that they can immediately implement within their organization. The dollar value of both the Professional and Professional Plus membership levels are double and triple the yearly dues. What this means is that the access to content and discounts members enjoy are worth substantially more than the cost of membership. Investing in your own professional development through a cost-effective ATD membership will pave the way to growing your own knowledge and skills, and increasing your value to your organization. By joining ATD, you will be exposed to more ideas, more knowledge sharing, and more best practices from industry leaders and experts—ideas you can implement in your own work. You gain access to an unparalleled network of talent development professionals from peers to mentors to industry leaders. From our online member directory to our annual conference and country, state, and regional events, there are a variety of opportunities to meet, connect, and grow your network—and your expertise. Customize this letter to your manager to help them understand why an ATD membership is a cost-effective way for you to add value to your organization. An illustrative overview of all the exclusive benefits you will receive once you become a member. Are you a senior (at least 65 years of age), student (currently enrolled in a minimum of 12 credit hours per year at a college or university), or a young professional (35 years of age or younger)? We have membership options for you. Tote bag offer is valid for US professional and professional plus memberships only. Cannot be combined with any other offer or alread-discounted group, enterprise, power, student, senior, or young professional membership. No adjustments can be made to previous orders.